When John Lennon divorced Julian’s mother Cynthia, Paul McCartney composed a little song to cheer the boy up. Eventually the song Hey Jules evolved into Hey Jude. 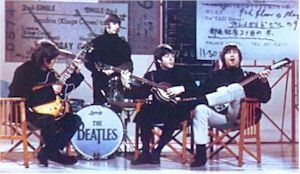 Prior to being named “The Beatles” the band had several names. In the late 1950s, John Lennon and Paul McCartney formed a group to play skiffle music in Liverpool pubs. They began as the Quarrymen, then became: Johnny and the Moondogs, the Moonshiners, and Long John and the Silver Beatles. They became “The Beatles” in 1960. In 1962, Decca Records rejected the Beatles, saying, “We don’t like their sound, and guitar music is on the way out.” The Beatles went on to become the most famous band in the world, achieving 20 US and 17 UK No 1 singles, more than anyone else. They also hold the record for the most No 1 albums of all time, with 15 albums on Billboard. They sold more records than anyone – over a billion worldwide. The band broke up in 1970.